The majority of the human eye is protected within the orbital cavity. The exposed section is protected in a limited fashion by various appendages such as the eyelids and brow. Surrounded by the capsule of Tenon, a thin membrane which provides isolation and facilitates movement, the eyeball is embedded within the fatty media of the orbit (see figure) . The structural attributes of the eye may be divided into three tunics: sclerotic and corneal; chorioid, ciliary body and iris; and the retina. The form of the globe itself is maintained by a hard, dense and unyielding fibrous membrane called the Sclerotic Coat (sclera). Its anterior surface is covered by the Conjunctiva, a membrane which provides the white colouring and is reflected to line the inner surface of the eyelids. Forming approximately 15% of the anterior of the globe, the Cornea is a transparent quad layer structure consisting of epithelial cells (continuous with the conjunctiva), a central fibrous structure (Substantia Propria), an elastic lamina, and endothelial cells which line the anterior chamber. The cornea is a non vascular structure and is continuous with the sclera. Approximately 85% of the posterior of the globe is comprised by the Choroid. A thin, highly vascular membrane, the choroid is loosely connected externally to the sclera and internally to the retina. At the point of exit of the optic nerve, the choroid is relatively thick in comparison to other sections and is firmly adhered to the sclera. The Ciliary Body is comprised of the orbiculus ciliaris, ciliary processes and the ciliary muscle. It is primarily involved with the formation of aqueous humour and in adjusting the eye to the vision of near objects (accommodation). The orbiculus ciliaris is continuous with the choroid. It is comprised of ridges which are arranged radially and is on the order of four millimetres in width. The ciliary processes vary between 60 and 80 in number and are similar in structure to the choroid with the exception being that the vessels are larger and are primarily longitudinal in direction. The ciliary muscle consists of two sets of fibres, circular and radial. By drawing upon the ciliary processes, this muscle contracts and thus relaxes the suspensory ligament of the lens causing the anterior surface of the lens to become more convex. The Iris, (latin for rainbow) so named from the various colours observed in different individuals, is a circular curtain which is suspended within the aqueous humour immediately behind the cornea. At its centre (slightly nasal to be precise) is the pupil, a circular aperture for the transmission of light, which changes in size with contractions of the iris. The circumference of the iris is continuous with the ciliary body and is connected to the corneaís elastic lamina by ligament. 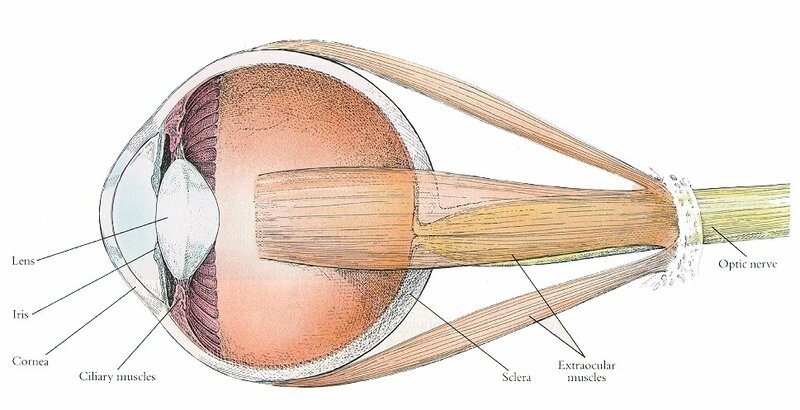 The retina forms the interior surface of the eye from the fovea centralis which corresponds with the axis of the eye to the ora serrata near the ciliary body. A highly complex structure, the retina consists of ten layers between the choroid at its outer surface and the vitreous humour at its inner surface. · Membrana limitans interna - the most internal layer, comprised of fibres known as the fibres of Müller. · Stratum opticum - a layer of nerve fibres formed by the expansion of the optic nerve. · Ganglionic layer - a single layer of retinal ganglion cells. · Inner molecular layer - a dense layer of fibrils which are interlaced with the dendrites of the ganglion cells and those of the inner nuclear layer (described below). · Inner nuclear layer - comprised of amacrine, bipolar and horizontal cells. · Outer molecular layer - a dense layer (thinner than the inner molecular layer) of fibrils interlaced with the processes of the horizontal and bipolar cells of the previous layer and the bases of the rods and cones (described below). · Outer nuclear layer - comprised of clear oval nuclear bodies named the rod-granules and cone-granules. Rod-granules being the more populous. · Membrana limitans externa - similar to that of the membrana limitans interna, this layer is also comprised of fibres of Müller. · Jacobís Membrane - the layer of rods and cones. These are the photoreceptors and will be described in more detail later. · Tapetum nigrum - a single layer of hexagonal epithelial cells containing pigment-granules. The optical or refracting media may be divided into: the aqueous humour; the vitreous body; and the crystalline lens. Little more than water (with some small amounts of Na and Cl), aqueous humour fills the anterior chamber (bounded by the back of the cornea and the front of the iris) and the posterior chamber (bounded by the back of the iris, the ciliary body and the lens) of the eye. Filling approximately 80% of the volume of the eye, the vitreous body is perfectly transparent. Bound within a thin and delicate membrane (membrana hyaloidea), the vitreous body is believed to be comprised of numerous laminations of nearly pure water with small amounts of salts and albumen. It is bounded by the retina, the ciliary body and the lens. The lens is a transparent body consisting of concentric layers ranging from soft on the surface to firm towards the centre. Surrounded by a highly elastic membrane, the lens is approximately 10mm in diameter and 4mm in thickness.